Lent is a time to focus on our relationships with God and each other. One bridge to the Sunday Morning “box” and to one’s home is with a Jesus Doll. After adding a home kit, it has been a wonderful tool to tie our parish and faith to a family’s home life. Children have loved their turn with the doll and kit. Parents love having a format to discuss Jesus and faith. The family gets the Jesus Doll and Home kit on Sunday morning and return it the following Sunday. I send an email during the week to let the coming family know their turn with the doll and kit will start the coming Sunday. I, also, send an email to the family who has the doll, asking them to send pictures and reminding them to bring it with them on Sunday. The photographs returned are full of smiles as the child(ren) take Jesus on their different adventures. Jesus has visited preschool classes, parks, parties, and zoos while with the children. Jesus, also, joins the family at dinner and bedtime. This is your week with St. Paul’s Jesus Doll and bag. Enclosed in the bag, you will find a folder with an activity sheet for each child in your family as soon as Jesus comes home and then an activity sheet when Jesus is ready to come back to church. Please, return the sheets with the doll and book in the bag. They will be used to make a display and a book. The bag, also, contains the book If Jesus Came to My House. Please read this with your child and use it throughout your time with the Jesus doll as a time to talk about Jesus in our homes and in our lives. Please email a photo of your child(ren) with the Jesus Doll and one photo of Jesus doing an activity with your family. These with the words will be put into a Shutterfly book that will travel with the doll in the future. Copies will be available for purchase if you would like your own. Included in this folder is a Parent Insights Page. Please write anything you would like to share about this experience for your family. Please, return the doll and the bag with all the contents the next time you come to the church. The doll and bag with new sheets will be passed on to the next family. 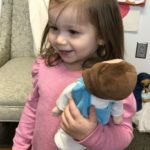 Any discussion questions you have with your children that you would like to pass on, please let Lauren know and those will be compiled to travel with the doll. Enjoy your visit with Jesus at your home and I hope you find ways to include Jesus in all your activities even beyond the doll’s visit. Two Activity Sheets for each child: one sheet asks the child to write or draw what they would like to do with Jesus during the coming week and the other is their favorite times with Jesus (write or draw) for child to return and then are displayed. The Jesus Doll and Home Kit was such a success, that I purchased a second Jesus Doll and book. This one goes to our school for classes to use. Jesus, also, attends our parish events. I get various pictures of Jesus with parishners or “doing” some of our regular activities. Click on any of the highlighted items to see what I used. Any items purchased through this link helps to fund this site. Lent in a Bag ready to go. Developing a way for families to worship, discuss, and bring Lent into their homes without the traditional fasting (or in addition to giving up a food item) is one of the ways we strengthen the bridge between the church and home. 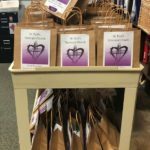 Lent in a Bag is handed out to all families with children on the first Sunday of Lent. Each year, I have a different theme with story items. This is to keep things interesting. For this year, the theme is Journey into the Wilderness. I am focusing on all the Bible stories about people who went into the desert and then came out to do their ministry. Each week the family sits around the table and pulls one object out of the bag. Attached to each object is a Bible story, a short write up with discussion questions. After listening to the story, eachfamily member passes around the object and answers the questions. The session ends in prayer. This is very popular and many of our families are excited to share Lent in a Bag with others outside of our church family! Jesus- after his baptism, he goes into the wilderness (Matthew 4, Mark 1 or Luke 4) The object is a small bag of sand. Jesus- in wildnerness tempted rocks to bread (Matthew 4: 1-10). The object is a rock. Moses leaves Egypt to shepherd int he wilderness (Exodus 2: 11-25). The object is minature sheep. Moses and the Israelites wander in the dessert (Exodus 32). The object is gold. John the Baptist (Mark 1: 1-13). The object is a clam shell. Ezekiel-having a heart for God (Ezekiel 36:24 – 37:14). The object is a heart. Abraham and Sarah (Genesis 18-25 summarized). The object is a baby. With the theme of into the wilderness as a precusor to ministry, I am hoping it encourages each person to think about their ministry. In the future, if they are driven “into the wilderness” in their lives, then to know an exciting ministry can be ahead in their lives too. By clicking on the links and purchasing any item through the link, helps to fund this site. Thank you for your support. Setting a Sunday afternoon in February as a Family Service Day teaches community service and outreach, encourages community and family togetherness, promotes living our Baptismal vows, and encourages practicing our faith. We gather at 4:00 PM in one large room. The story of the Parable of the Good Samaritan is shared and then Jesus washing the disciples feet is shared. We have a short discussion on what loving and serving our neighbor means. Cooking Class and Making a Meal for the Ronald McDonald House: The instructor shares about what the Ronald McDonald House does. Then we make a meal for 40 people together. We generally make it storage ready, so the Ronald McDonald House can use it for a fill in. This way, all ages can participate in this activity. (We start it at 4 years and up). Supplies needed are: someone to lead the cooking class, fodd items needed, measuring supplies, storage containters, instruction notes for guests of the Ronald McDonald House and someone to deliver to the house. The families learn about cleanliness and safety during the class. Love “Caroling” and Flower delivery to a Nursing Home: A music leader teaches simple songs about loving God and God’s love for us. We load up in the church bus (or carpool) and go to the nursing home, where they are expecting us. We sing about 15minutes then the children hand out flowers. The residents of the nursing home love having the families visit. Supplies needed: someone who knows songs (and motions), instruments (if desired), and flowers. Animal Blanket and Toy Making for the Humane Society: A speaker from the humane society comes to talk about caring for our animal friends and what the Humane Society does. The speaker, also, bring some animal friends. We make sewless blankets out of fleece and dog/puppy toys out of PVC pipe, dog food, and pvc caps. A family signs up in advance for which project they would like to do. It is a lot of fun and we are generally done in an hour to an hour and a half. With Martin Luther King, JR. Day approaching, it is an opportunity for the church to offer a lesson or event based on our Baptismal Vows and the Commandment to love our neighbors as ourselves. Children will have learned in school about MLK’s “I have a Dream” speech. (Have some copies on hand, just in case). Jesus’ “dream” of all people being treated with dignity showed through in his Parable of the Good Samaritan, his talks of the lowly as named by society, and his meeting the Samaritan woman at the well. An event or lesson would include the telling of the Parable of the Good Samaritan and the woman at the Well. It would include opportunities to interact with people the children/families would not normally socialize with or feel comfortable doing so. This is a great time to expand people’s comfort zone. Some ideas include: invite someone from the homeless shelter, a family who is being helped by the food bank, people of different cultures, someone living in a nursing home, and someone who benefits from your parish outreach program. Have the guests prepare with: what would you like us to know about you? What is a typical day like for you? Since we vow to respect the dignity of every human being, what are ways you feel disrespected and how can we interact with you that helps you to feel respected? Have some activities. If from a different culture, maybe a craft or activity from that culture. If from an outreach program, have information about the program, a list of ways to get involved and a small project to get the children involved in the outreach program. This can make adults feel uncomfortable, but that is why we avoid the outcast. This is a chance to learn empathy, compassion, and how to treat others with respect and dignity. Here are some children’s books on Martin Luther King, Jr: I am Martin Luther King, Jr (Ordinary People Change the World), I have a Dream Book & CD, A Picture Book of Martin Luther King, Jr.
January 6th is Epiphany. After the rush of Christmas, hosting an Epiphany event is a perfect way to celebrate the end of Christmas and the manifestation of Christ to the Gentiles as told by the Magi (Kings/wisemen) visitation. My Epiphany Event is inter-generational with activities for all ages. I have stations so people can interact and do the activities that interest them. The stations are open for 45 minutes to an hour. When the time is over, we all move to Nave. In the Nave, either an Epiphany Service or an Epiphany Pageant with the Magi visitation is done. Photo area with capes to become the Magi (they use the crown they made): background, props (for king gifts). Coloring pages, stickers, and other artistic materials for young. Mazes and puzzles for older. Star Cookie Decorating: sugar cookies (made in advance-star cutter), icing, m&ms, sprinkles, small plates, and napkins. Click on the items to see what I have used. By purchasing through the link, you are helping fund this site. Thank you! Nothing brings greater understanding to a child (or any person) than participating and living out something they did not fully grasp. Having a Bethlehem Village, where life is recreated in Bethlehem arond the time Jesus was born, brings the time to life and creates an understanding of what life was like and how very different life was from today’s times. To create Bethlehem Village, three parts are required. The first part is the decorations to turn the area into Bethlehem. The second part is “shops” or stations with educational, interactive and fun activities and crafts. The third is volunteers who take the part of the villagers. For decorations, I use bales of hay, lots of fabric for table covers, scenic background, and props. Each shop is a table covered in a bright fabric with educational materials, props, pictures, and a work area. The shops and workers are the leather-maker, the metal worker, the carpenter, the baker, Hebrew School, the Synagogue, the shepherd, the potter and the inn-keeper. Each shop has lots of information of what would have been in the shop during Jesus’ time and how things were used by the people. For activities, here is a listing of what I have done: Leather- Maker’s Shop- fake leather bookmarks, bracelets, making leather bags (to carry small items). Metal Worker-gold picture using gold foil and a wood “pencil” to draw on back. Flip over and have an embossed picture. Carptenter- wood ornaments, wood objects or blocks of wood to paint, and sandpaper. Baker- barley to grind, bakery treats (cookies) to eat. Hebrew School-Hebrew Alphabet, primer, guide, pencils, paper,dreidal with instructions and coloring pages for the children. Synagogue-Menorah, meditations with objects, list of sins and suggested sacrifieces from the Bible, coins for coin changing. Sheperds-toy sheep, mazes, puzzles, coloring pages. Potter-clay for them to shape and take home. Inn-keeper- small cot with various cleaning items, drinks, and activity to make a “Welcome” door sign. At each shop, their passport is stamped. 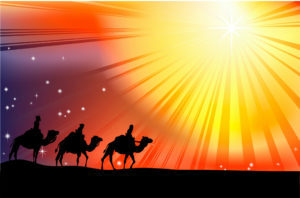 After an hour of Bethlehem Village, the Magi (kings), come searching for Jesus. We follow them into the Nave where a retelling of the Nativity story is done and the Magi speak about why they search for Jesus. We sing some songs and say some prayers. We have an area for parents to take pictures of their child and the Magi. The volunteers are gathered in advance, given their parts with information about what their shop was like. They read up on the work and the life, so that when, they come to do Bethlehem Village, they are prepared for any questions the visitors might have. There are lots of different ways to do a Behtlehem Village. If you do it before Christmas, the Shepherds could come looking for Jesus (instead of the Magi.) Petting zoos, large animal cut-outs, or more characters can be added. For smaller, just choose four shops to have and have it before the usual Christmas Pageant. Getting the word out to surrounding neighbors and schools, makes the event an ideal “on-ramp” for people who have not regularly attended a church. This event is fun, educational, and promotes fellowship, as well as, hospitality. For information on items used in the shops or decorations, please click on the link. By purchasing items through the links, helps to fund this site. Thank you. Watching a Christmas movie, may not feel like an event a church should host, but it can be a gift of slowing down, spending time in community, and giving a faith perspective on a season rushing towards a Christmas overload. Choose a family movie that is appropriate for all ages. I have done Charlie Brown Christmas, Rudolph the Red-Nosed Reindeer, Elf, and other classics. Some movies are wonderful for adults (It’s a Wonderful Life), but are too slow for the younger crowd. I try to pick movies that are less than one and a half hours. Preview the movie and come up with five to seven discussion questions that as a community of faith, what are the ethics, faith, and love-based questions that come up? After the movie, have the discussion, encouraging all (and all ages) to answer. It makes for great community building and encourages those who normally would not interact, to get to know each other. Clicking on a link and purchasing the product helps to fund this site. Thank you! The Christmas Pageant is a part of tradition. It can be as big and rehearsed or as small and spontaneous as one chooses. It is a beautiful way to tell the story of the nativity, get children involved, encourage participation, and increase joy during a hectic, time-crunched time of year. The Christmas Pageant can be appropriately done on the Fourth Sunday of Advent during the Sunday School (Christian Formation) time, on Christmas Eve during the earliest Service (as the Ministry of the Word) or on Epiphany as an Epiphany Pageant (just add the Magi). If the Fourth Sunday in Advent or Epiphany is chosen, add to the festivities with crafts, and refreshments. Publicize, invite, and encourage children from outside the church to come and participate. On Christmas Eve, new families attend and, usually, everyone leaves afterwards for scheduled plans. In advance, I print instructions for families with children telling them where to go to get dressed and where to go afterwards to return the costume. Every child, who walks through our door, gets a chance to participate. In the costume room, I have volunteers waiting to help the children. Each child is asked whether they would like to be an angel, shepherd or animal. I have chosen and rehearsed with older children to be Mary, Joseph, Lead Angel (guides the little angels), Lead Shepherd (guides the little shepherds) and Lead Animal Tamer (guides the animals). I, also, have chosen and rehearsed with the readers/narrators their parts in advance. The Lead parts have rehearsed the songs we will sing, too. It is the first verse of known carols, so the congregation/audience may participate too. Angels are, probably, one of the most used creatures in movies, art, theater, books, and other forms of media. Yet, very rarely, are angels shown as the angels in the Bible. Most of what people know about angels comes from the arts, not the Bible. Hosting an Angelic Event during Advent encourages learning, Bible knowlege growth, fun, fellowship, and a way to keep the holiday season faith focused. Families, congregation member, children and youth gather for stories of angels in the Bible verses the angels depicted in the arts. This, also, encourages parents to be their children’s main faith teacher, build a time of community, encourage exploration and help families to think of church and faith beyond Sunday mornings. I set this up as stations to encourage everyone to move about and explore. One can have as many or as few stations as one would like. I, also, set up a cookie and lemonade table for when people get hungry, as well as chairs for fellowship. Learning about Angels: Make Q & A posters (interactive-queston on one sheet taped to posterboard with answer on another piece of paper. They lift up the question to read the answer.) Questions include- What are the types of angels mentioned in the Bible? What are the four roles of Cherubim? How many times are Seraphim mentioned in the Bible? What forms do the Living Creatures Angels take? What angels have names in the Bible? How many angels are there (according to the Bible)? Do angels have wings? Are angels easy to spot (see)? What three people in the Bible does an angel come visit to tell them they will have a baby? What does Gabriel’s name mean? Were angels created by God or have they always been there? Are guardian angels mentioned in the Bible? The answers have Biblical Scripture text. Angel Reading Station-books, angel dolls, angel statues, Christmas tree angels (Here is a few angel dolls to start off –one blonde and one brunette. For angel statues, here is one neutral hair and one child friendly. Angels in the Arts-pictures with information of how angels have been depicted and any information about the artist, the media work, or the angel. A book with some information and pictures in Angels in the Arts. Station with name tags and Information sheet for parents on activities to do with child for faith. Small Child station with coloring pages, crayons, and simple crafts to make. I schedule a volunteer at each station. Every year, the ornament can be changes and other stations can be added. Clicking on the links of items above and buying through the link, helps fund this site. Thank you.